For the most part, the ants that you see roaming around your home are pretty harmless. But, when you wake up one morning and find that hundreds of them have invaded your kitchen pantry, it’s hard not to crumble in frustration and a feeling of defeat. While they may not bite you or carry any threatening viruses, getting rid of them is quite the chore. While most people understand that cleaning up the ants you see now, or throwing away the box of food that they have gotten into won’t solve your problem, and that more ants will soon appear, many people are under the impression that if you can locate the nest where the ants are coming from, then you can treat the infestation entirely. Unfortunately, that’s not always the case. The most important thing to remember about ant colonies is that they have multiple satellite nests. This means that the ants you find in your home can have one nest in a tree in your backyard, another nest in your kitchen, one in the gutters of your home, and another nest in your garage. So essentially, tracking the pattern of a few ants until you find that they seem to be going to a source such as underneath your back deck will only solve a small portion of your problem. That’s another reason why some store bought remedies won’t always work– because you have to stop the ants at the source, which you can’t always find. Instead, if you notice that you have an ant infestation in or around your home, you should promptly contact a pest control company to come and inspect the problem. Without the proper training, even if you are told the signs to look for that would indicate a nest, you may not always be able to spot a hidden or buried colony, he says. To deter ants from coming in to your home, we suggest examining all of your food products, especially those that are kept low to the ground in boxes, and where dry dog or cat food is stored, as this usually attracts ants as well. If you feel that something may pose a risk, such as an opened cereal box for example, dump its content into an airtight, sealable plastic container to ensure that ants won’t be able to gain access. Once ants find a viable source of food, you can almost guarantee that they’ll keep coming back until you take the appropriate action to exterminate the problem. Ants species vary in size and color. Pavement Ant colonies can average 3 to 4 thousand ants, with several queens. Ants are social insects, meaning they live in colonies that typically have three castes, workers, queens and males. In ant biology, the queens and males are reproductives. In an ant colony, workers are sterile females. Workers seldom have wings and are constantly doing what their name implies–working. They construct, repair and defend the nest, and are also expected to feed and care for the rest of the colony including the young, the other adults and the queen. The queen is usually winged until she first mates, at which time the wings are shed. The primary function of the queen is to reproduce, but in some species she will care for her first brood of workers until the colony’s numbers increase. A queen can live and reproduce for many years and may be replaced eventually by a daughter queen. Males are typically winged and will retain those wings until death. The sole function of a male ant is to mate with an unfertilized female reproductive or queen. After fertilization occurs, the male dies. Once maturity is reached, males rarely remain with their original colony. What can be done to prevent them from getting inside? Reduce the number of entry points. For example; seal all cracks and holes with a silicone base product around the foundation, doors, pipes, wires, vents, and windows. Most ants are considered nuisance pests, mainly due to their large numbers and foraging habits. However, carpenter ants are a wood destroying insect. They are attracted to damp or decaying wood. If left untreated, over time they can cause serious structural damage to a home. Ant identification is can be critical to solving the ant infestation. By identifying the ant, you better understand ant nesting sources, the size of the ant colony and what chemical and non-chemical treatments will best solve the ant problem. Ants are considered to be one of the most successful insects on earth. With over ten thousand different species of ants, they are highly adaptable creatures that are extremely difficult to control once they have infested an area. Considered pests around the home due to their tendency to feed on and contaminate human food, create ugly mounds in lawns and infest and cause damage to structures. Some species of ant can inflict painful bites and stings. No species of ant feeds on or attacks fabrics, wood or leather, but depending on the species (particularly Carpenter ants) can cause as much or more damage to wood than a colony of termites. Prevention is truly the best line of defense against the infestation of any pest insect. A thorough inspection of a home and yard can reveal potential infestation problems and possible solutions for the infestation. Cleanliness is most defiantly the best tool in the prevention approach. Any food or food particles are a major attraction to ants. Cleaning up quickly and storing food in air tight containers is critical. It is also important to seek out and repair any moisture problems in the home. Check for condensation problems and leaks and have them rectified as quickly as possible. Indoors, ants will nest in walls, behind baseboards and beneath the foundation of the house. Carpenters ants in particular will especially seek out decaying or moist wood and create galleries for nesting purposes. Smaller ant species can fit through the smallest cracks and holes in order to gain access to a home. What you need is an exterminator who will locate the nest location(s) and eliminate all the ants. Pest control experts are able to tell the difference in ant species, which means they require different treatments. Also, they are well trained in locating their nesting location and terminating the colony in a timely manner, of course using a nontoxic organic product line. Ants that are typically considered as pests that can become household pests are Pharaoh Ants, Carpenter Ants, Argentine Ants, and Red Imported Fire Ants. It’s official: you’ve got a pest problem in your home. Whether your culprits are mice, fleas, fruit flies, ants, or any other insects, pest control is something you should consider carefully before acting. Pests seem to come out of nowhere, and before you know it you have an infestation and a problem. Whether you’re inclined to call the experts, or are more of a do it yourself kind of person, here’s what you should know. Do It Yourself Pest Control. Doing it yourself can be a very attractive pest control option. It’s convenient, you don’t have to make any phone calls to schedule appointments, and it’s almost always less expensive than having an expert professional visit your house.The cost range varies widely; you could pay as little as $50 for a do it yourself bait kit for getting rid of ants, $40 for a spider kit, involving pesticides, or $75 for a heavy duty scorpion kit. What you are paying for, though, is materials, not service; the success of your quest depends on the quality of the product you bought – and whether or not you applied it correctly. While it might be a fine idea to target “lesser” insects like fruit flies by yourself, you won’t want to go it alone, for example, on a major termite infestation. And if problems persist after your initial treatments, you should definitely consult a professional exterminator. Professional Pest Control. When you call a service professional to solve a pest problem, you pay for their expertise and time, in addition to products. For this reason, professional pest control is significantly more expensive than do it yourself – the cost range varies widely, depending on service and type, but can cost several hundred, or even thousands of dollars.Despite the cost, though, this route is far more likely to yield better, more lasting results, partially because pest control experts know where to look for infestations. Bugs have a way of hiding in hard-to-reach places, and you want to make sure your pest control method is thorough – and, hopefully, final! We’re in the midst of a terrifying epidemic, although you wouldn’t know it to talk to most doctors and health specialists. The disease is growing at a rate faster than AIDS. From 2006 to 2008 alone, the number of cases jumped a whopping 77 percent. In 2008 alone, the Centers for Disease Control and Prevention listed 28,921 “confirmed” and 6,277 “probable” cases of the disease, but there could be as many as 420,000 because of underreporting. Prominent victims include Parker Posey, Richard Gere, President George W. Bush, Alice Walker and Christie Brinkley. If any other disease had stricken so many people, the medical community would be scurrying for knowledge, scrambling for cures or rushing to warn patients (think swine flu). But that’s not the case with Lyme disease — a disease carried by ticks. Instead, ill-informed doctors are often flummoxed when patients complain of fatigue, headaches, fever or chills, muscle or joint pain, mental confusion, swollen lymph nodes and neurological symptoms. It’s an appalling display of indifference. As Lyme Disease Awareness Month comes to a close summer travelers flock to grassy, tick-infested holiday spots across America, vacationers and physicians alike need to be on the alert for freckle-sized menaces that are responsible for the fastest-growing, most misdiagnosed infectious disease in the country. The CDC has a map that shows where the ticks are most prevalent. Unfortunately, many victims of this poppy-seed-sized predator spend months or years without effective treatment, because perplexed doctors wrongly diagnose chronic fatigue, fibromyalgia, lupus, multiple sclerosis, Parkinson’s, Alzheimer’s, arthritis or psychiatric disorders. Each of us needs to inspect our bodies for tiny, black intruders and tweeze them out before they have time to infect us with any number of diseases. But more important is the need for public health community to treat this disease like the epidemic it is, and start putting real resources into educating the public and the medical profession about how to identify it, treat it, and prevent it. High risk areas for tick exposure in Minnesota include the north central, east-central and southeastern regions of the state, also extending into some northwestern counties. Greatest risk is found within hardwood or mixed hardwood forests, which provide suitable habitat for blacklegged ticks. Risk of bites from these ticks in Minnesota is highest during the spring, early summer, and fall months. 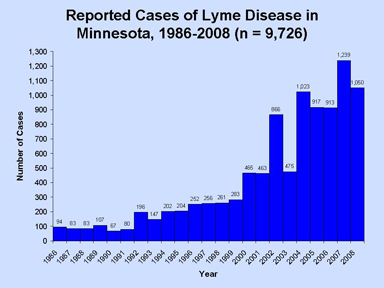 From 1986 to 2008, more than 11,000 cases of tick-borne diseases were reported in Minnesota, of which the majority (more than 9,700 cases) were Lyme disease. One thousand fifty confirmed Lyme disease cases were reported in 2008. A record number of 1,239 confirmed Lyme disease cases were reported in 2007, and near-record numbers of Lyme disease cases were reported in 2004 (1,023 cases), 2005 (917 cases) and 2006 (913 cases). 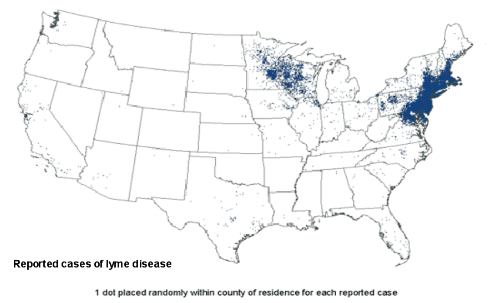 The number of Lyme disease cases has been increasing dramatically since the 1990s. A variety of factors, including increasing physician awareness, increasing infection rates in ticks, and expanding tick distribution may have led to this trend. The Lyme disease cases in 2008 ranged in age from infants to 95 years; the median age was 40 years. Thirty-two percent of Lyme disease patients in 2008 were under 18 years of age. In 2008, 64% of Lyme disease cases were male. 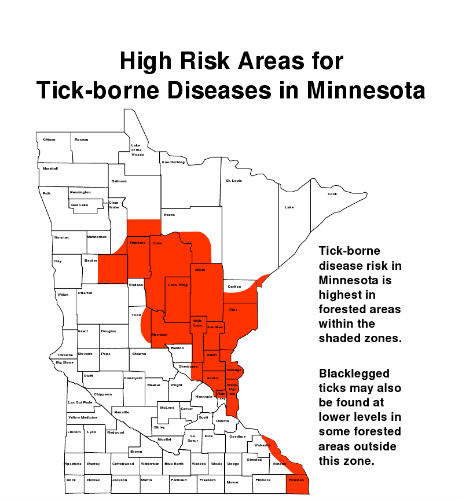 Exposure to blacklegged ticks (deer ticks) and Lyme disease in Minnesota occurs primarily from May to July, and again in the autumn, when people are outdoors and ticks are actively feeding. The majority of cases occur in June, July, and August, peaking just after the mid-May to mid-July period when the nymphal deer tick is feeding. This lag is due to the 3-30 day period between an infected tick bite and the start of signs and symptoms. If you ever have any doubt as to which tick you have encountered, contact a pest control expert for identification.